"Do Not Covet Your Ideas"
It's easy to understand why you'd want to safeguard every idea you have, but it's probably not the best way to get things done. Motivational author Paul Arden suggests you're a lot better off freeing your ideas, and staying hungry for new ones. Paul Arden, author of the book It's Not How Good Your Are, It's How Good You Want To Be, suggests giving away your good ideas. 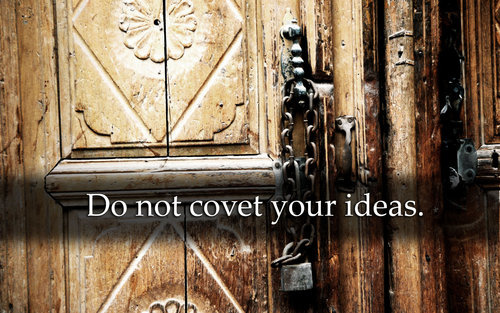 DO NOT COVET YOUR IDEAS. 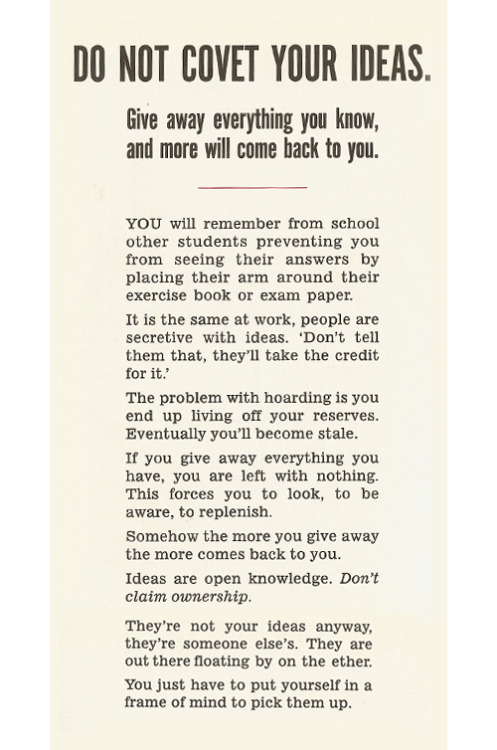 Give away everything you know, and more will come back to you. You will remember from school other students preventing you from seeing their answers by placing their arms around their exercise book or exam paper. The problems with hoarding is you end up living off your reserves. Eventually you'll become stale. If you give away everything you have, you are let with nothing. This forces you to look, to be aware, to replenish. Somehow the more you give away the more comes back to you. They're not your ideas anyway, they're someone else's. They are out there floating by on the ether. You just have to put yourself in a frame of mind to pick them up. In a time of mass and instantaneous communication it does seem silly to sit on and hoard ideas when they could be out there doing good and being brought to fruition. Sound off in the comments with your thoughts on the quote. Send an email to Jason Fitzpatrick, the author of this post, at jason@lifehacker.com.